We don’t particularly like wasps. They do eat pests and pollinate, but they also crash picnics, and no-one likes an uninvited guest. We do like this one though, Ciamoslaw Ciamek‘s ‘Blacktron Wasp Intelligence Interceptor’ which, like its namesake, has a sting in the tail! See more at the link. The crafty reprobates of Blacktron have been keeping a low profile for these past fifteen years. Once the most formidable group in the galaxy, Blacktron made a living from Space Evil, which is much like regular Evil, only in it occurs space. It seemed that by 1993 though, their number was up, and Blacktron mini-figures were subsequently only to be found in the cells of the Space Police. However it seems not all of Blacktron’s members were caught, with some disappearing into the cosmic underground to plot a glorious return. Emboldened by the recent resurgence of other classic space civilisations, the dastardly mini-figures of Blackton have decided that now is the time to stage their comeback, and what a machine they’ve built to do it! With six enormous wheels, a fully appointed ten-crew interior, a rotating gun turret, and – in true old-school LEGO space style – a smaller scout vehicle hidden within itself, the Blacktron B-59 armoured personnel carrier is ready to help the Blacktron empire rise once again! The words of well-known poet Wiz Khalifa there, rapping about wasps, or taxis, or school buses, or Watford Football Club. Whatever he’s on about we have two black and yellow creations for you today, and each is miles better than Wiz’s affront to lyricists everywhere. First up (above), suggested by a reader, is Nathanael Kuipers’ Renualt RS2027 Vision, and if it’s the future of Formula 1 after the introduction of cockpit canopies we’re all in. See more on both Flickr and MOCpages. 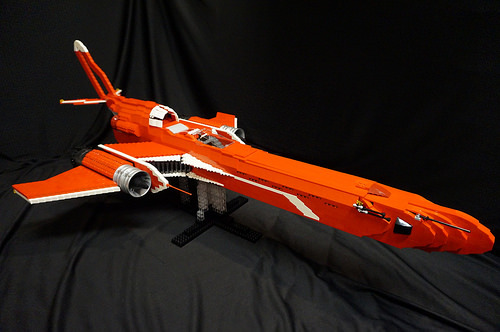 Today’s second creation (below) comes from Brick Knight of Flickr, who has equipped those thieving space pirates at Blacktron with one hell of a cool ride. There’s more to see more of his beautifully photographed Blacktron Scout Buggy via the link above. Milan Sekiz has seen a rover and he wants it painted it black. No colours anymore, apart from black, yellow and trans-red are in this series of builds. It also includes a bike, spaceships and a couple more items yet to come. If, like our Elves, you enjoy Transformers, then click on to Milan’s Photostream, where you can see one of those too. 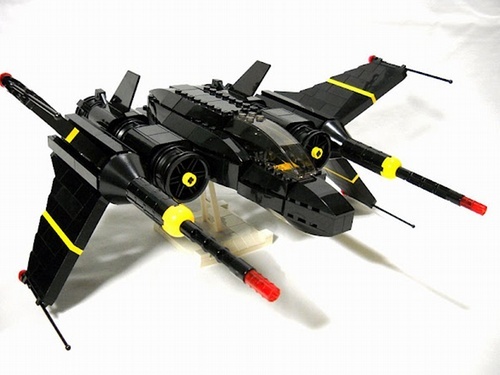 We rather like LEGO’s evil Blacktron empire from the Classic Space era, and we really like hot rods, so combining the two – as regular bloggee Horcik Designs has done – is a surefire winner. See more of the mash-up on Flickr via the link above. 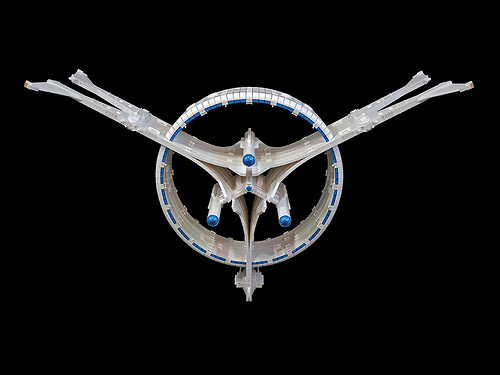 The great Sci-Fi Building race that is SHIPtember is now officially over and has given way to Ma.Ktober. 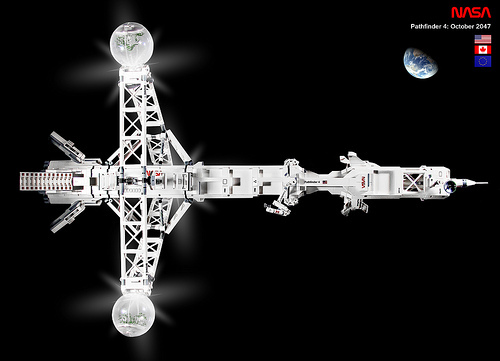 105 monster spacecraft, each over 100 studs long and each a Seriously Huge Investment in Parts, were completed. 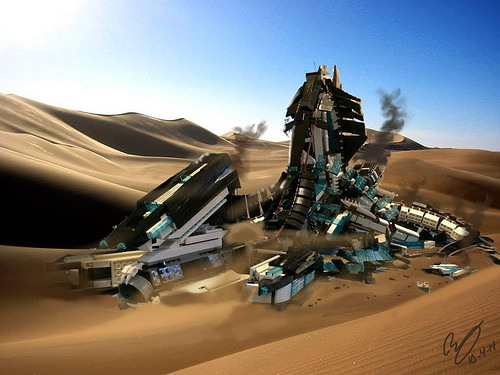 Many SHIPs also fell by the wayside, as their builders struggled to find building time, inspiration, a suitably strong enough Technic skeleton or waited nervously for Bricklink orders. There were some awesome thin-ships, bulky battleships and variations on the Classic Space, Blacktron and Homeworld themes. Some builders chose to tackle the challenge in novel and unusual ways and we thought that we would feature these builds in this post. At the top of our post is Jonathan Walker’s beautiful “Eye of Misfortune” . This has been built using “brick bending” type techniques to achieve its smooth curves and is greater than 100 studs “in some dimension”. It nicely complements his SHIP from 2013 and we wonder if Jonathan has a special deal on white bricks at his local LEGO Store. Whilst most SHIPs fall into the big & grey category, Chris Rozek’s “Yagami-Maru II” stands out in its red and white livery. Being a car blog, this reminded us of Starsky’s Ford Gran Torino, with its white vector stripe, which made us especially happy. The next SHIP excited the Elves, as it contained something designed to be eaten, that wasn’t LEGO. SHIPtember’s rules state that builders should only work during September. 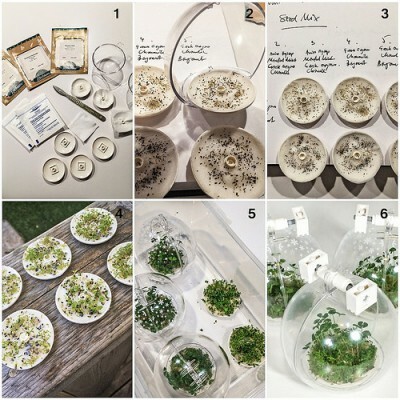 Canadian builder Halfbeak was also out in his sunny garden, germinating camomile and mint on first aid dressings to go into the biomes on his “Pathfinder 4”. In addition to this novelty, Halfbeak has included a bunch of details in authentic NASA style, including the Canadian built manipulator arm. Having recently featured Bionicle for the first and probably last time on this blog, we now come to the first and probably last Duplo creation to be featured here. Wm Byron Duncan’s “8-Belle” is a mind-boggling 100 Duplo studs long. 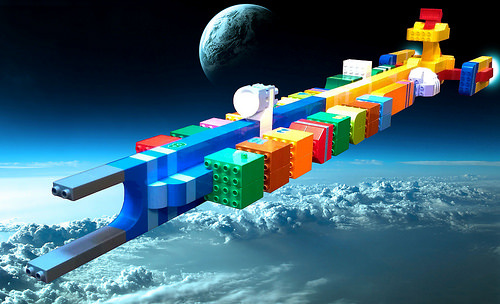 His Flickr Photostream is well worth a visit to see his other Duplo spacecraft and tips on DUPLO SNOT techniques. This SHIP is 100% Duplo, which does unfortunately mean that it isn’t swooshable, if you could pick it up to start with! One builder who had to endure a nervous wait for several Bricklink orders was Jacob Unterreiner. 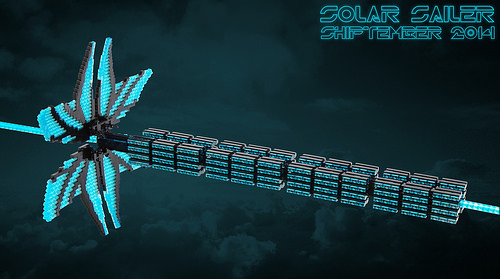 His Tron themed “Solar Sailer” features 96 identical modules and a beautiful brick-built sail. Our penultimate SHIP is Karen Quinn’s colourful “Queen of Hearts” whose distinctive stripes give it the look of a spaceborne mint humbug. Karen has succeeded in creating an interesting shape from some of LEGO’s bigger chunks of plastic, which is a tough thing to achieve. The Queen of Hearts also features lots of playable features and an unusual domed front windscreen, complete with eyelids. Last up is Peter Mowry’s “Battle Scarred Hexan Battleship”, built in his trademark style. Although a few SHIPs did suffer accidental collapses and crashes, Peter has deliberately broken his SHIP to make this unusual presentation. 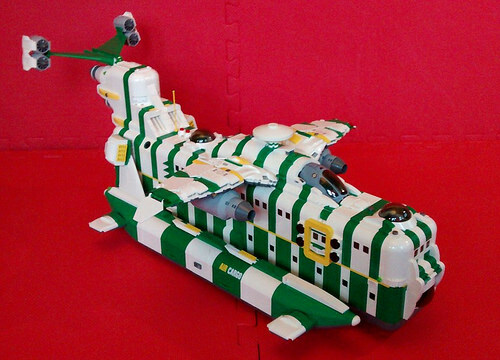 We’ve featured just a small portion of the 2014 SHIPtember builds. To see more, click this link to the SHIPtember group on Flickr, where you can also vote for this year’s People’s Choice Award. Congratulations to all of the builders who completed a SHIP this year: the SHIPtember 2014 poster is going to be awesome! Well, what do we have to say about this? Any Blacktron vehicle full of RC functions is a win/win situation! See more of this awesome vehicle at Vladimir van Hoek’s MOCpage. That’s not what I ordered! Peter deYeaule rumbles onto the scene in his Blacktron Light Tank, or BLT for short. It reminds us of Sir Killalot from Robot Wars (whatever happened to that show?). You can see more on MOCpages at the link. *Not really. But if it were back it might look a little something like this. MOCpages’ Peter deYeule locked an X-Wing in a room with a 1980s Blacktron Spaceship, lit some candles and turned on some Barry White, and this is the result. His X-1 Space Fighter has all the sleek goodness of modern building, combined with the classic retro yellow-on-black paint-job from decades past. View more on MOCpages.